From the Laureate to the romantics, we've welcomed one or two gentlemen of letters to Gin Lane lately and today we're visited by another. 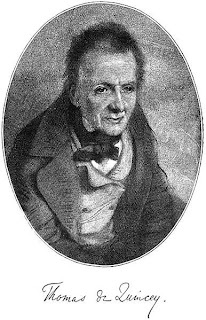 It's the chap who makes even grandmother Gilflurt look tame, the notorious Thomas De Quincey. Born as plain old Thomas Quincey, the man who would become known as the Opium Eater was the son of a successful linen merchant, Thomas, and his ambitious, intelligent wife, Elizabeth Penson. A martyr to ill health, the young boy was bookish and private, preferring his own company to that of other children including his own five siblings. His father was frequently overseas on business and when he died in 1793, the bereaved family took up residence in Bath, where the widow Quincey changed the family name to the grander sounding De Quincey. The boy did not get on well with his own somewhat boorish brothers and he preferred to spend time with his sisters or alone, creating imaginary kingdoms that he would later discuss in his adult writings. Thomas initially attended King Edward's School in Bath and excelled in Latin and Greek. However, he fell ill and was removed from the school by Elizabeth, who believed her son was becoming arrogant . Accordingly, she moved him to a less notable school in Wiltshire where he would experience a more rigorous religious education in keeping with his mother's values. 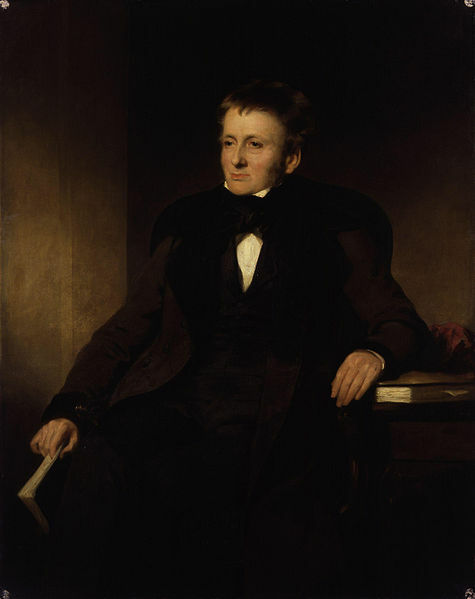 Developing a fascination with the work of the Romantics, De Quincey suffered from deep depression in his adolescence and took particular solace in the works of William Wordsworth, a man whom would one day number amongst his closest friends. Absorbed in literature and the classics, the boy's advanced intellect far outstripped that of his peers and at the age of 15 he became a student of Manchester Grammar School. De Quincey's path was set as far as his mother was concerned; three years in Manchester would be followed by further study at Oxford University and then into the world of work. However, the young man had very different plans. Less than two years into his studies at the Grammar School, the deeply unhappy De Quincey ran away. He was recovered by his uncle, Colonel Thomas Pensey, who convinced Elizabeth to allow her son to take a solitary wander through Wales funded by a guinea a week from the Colonel. In fact, De Quincey's allowance soon dried up as he neglected to tell the Colonel where he was staying and he found himself impoverished, descending deeper into depression. Tiring of the seclusion of Wales he went to London and lived in poverty, preferring destitution to the prospect of returning to the family home. He wrote at length of his experiences in London living amongst the poorest of all its inhabitants as he attempted to secure a loan from various unsavoury characters. 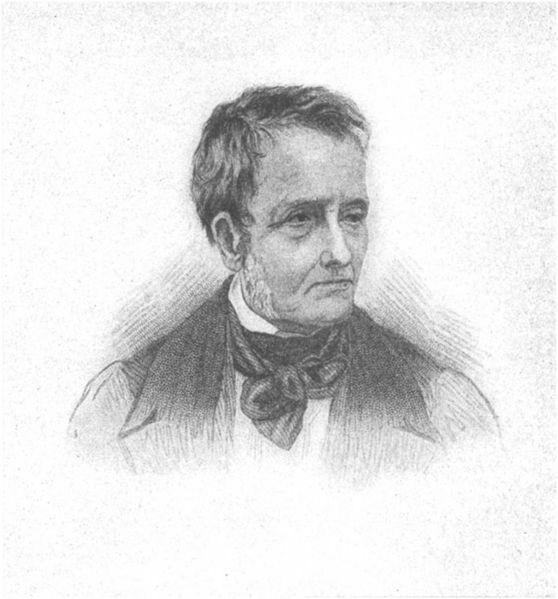 In fact, De Quincey was rescued from his predicament by friends and he finally picked up his academic career at Oxford University. Deeply affected by time in Wales and London, the young man lived an isolated life at Oxford and in 1804 began experimenting with opium to combat dental neuralgia. Despite completing his studies he failed to attend his final examination and did not graduate, preferring instead to spend time with his adored Wordsworth and Coleridge, another literary idol. In fact, in 1809 he rook up residence in Wordsworth's former home of Dove Cottage at Grasmere and lived simply, eking out a living as his consumption of opium increased. De Quincey was devoted to the Wordsworth family and upon the death of he poet's young children, became heavily dependant on opium to combat his overwhelming grief and a recurring stomach disorder. Taking daily doses, De Quincy moderated his use only slightly after his marriage to Margaret Simpson in 1816 and the couple enjoyed a happy union. Two years later he became editor of the Tory Westmorland Gazette, though he remained in the role for less than a year after arguments with the owners led to his departure. Whilst working in London in 1821 he finally began to write his own opium memoirs, the story forming a very popular series in the London Magazine. The Confessions of an Opium Eater became hugely successful when published in a single volume and De Quincey found himself at the centre of a sensational literary storm, his writing, conversation and intellect in high demand. The author moved to Scotland after the publication of The Confessions where he continued his addiction, the money he made from his literary and journalistic efforts being ploughed back into opium and the service of his spiralling debts. He and Margaret had eight children before her death in 1837 though only three outlived their father. In fact, it was these three daughters who finally took charge of his spending once Elizabeth died, leaving her financially-strapped son with an income of ₤200 per year. Under the guidance of his children the writer was finally able to live something approaching a settled life, enjoying a level of security and comfort in his later years. 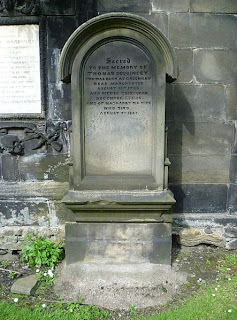 The infamous De Quincey died in Edinburgh and was laid to rest in St Cuthbert's Churchyard. Though highly productive, he published a surprisingly small amount of his literary output and is chiefly remembered today for the scandalous Confessions. The writer's story has continued to fascinate and his work remains in print today, the influence of Thomas De Quincey stretching far beyond his lifetime. Funny because I was reading this thinking how reminiscent it is of Constant Lambert who went to Christ's Hospital, the same school I attended, and then you brought up Coleridge who also went there! It's a sign of the times! Fascinating read! It's another good reason to have children!!!! Oh yes, I didn't think of Lambert until you mentioned him but I see that, definitely! What a stormy education and intellectual career. The connection between the Romantic Movement and depression is so vividly illustrated. Depression almost seems a style among romantics: With Wordsworth, it was more related to his disillusionment with the French Revolution; with Coleridge, his depression seems more related to his own demons and increasing use of opium. Everyone (Goethe included) seems to be longing for something just beyond their reach. They do indeed; it is certainly a shared theme through the biographies of the Romantics. I think you should as a counter balance have a blog on Thomas Love Peacock and his novel 'Nightmare Abbey' which satirizes the more extreme elements of the Romantic Movement and the Sorrows of Werther by Goethe. I think you're right; leave it with me!